I started off the new year eating squeaky clean paleo as I indulged way too much during the holidays. I think it’s necessary to hit the reset button every once in a while when I feel like I’m straying away from a clean diet. A couple of weeks ago, I spent several hours prepping homemade stocks, soups, cauliflower hummus and chopping vegetables and fruit to put in the freezer for easy access during the busy work week. I think spending a few hours on a Saturday or Sunday prepping for the upcoming week is a huge timesaver and helps me to stay on track. One of my favorite side dishes is a simple green salad with balsamic vinaigrette. Most store-bought vinaigrettes and salad dressings contain sugar and other unnecessary things, so I always prefer to make my own. 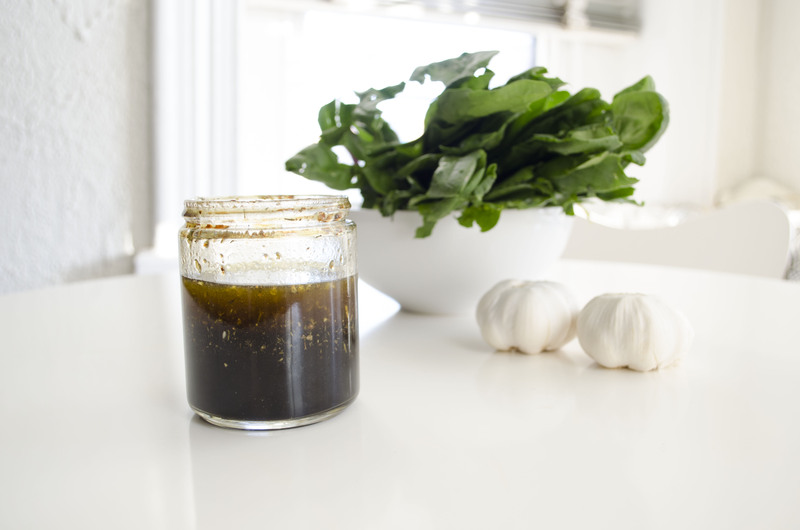 Making homemade balsamic vinaigrette is so easy and uses ingredients you probably already have at home. 1. Combine all ingredients in a glass jar, seal tightly with a lid and shake until ingredients are well combined. 2. Serve over salad greens or other vegetables and store leftovers in refrigerator for 1-2 weeks.